Check, plan and remotely execute backups. 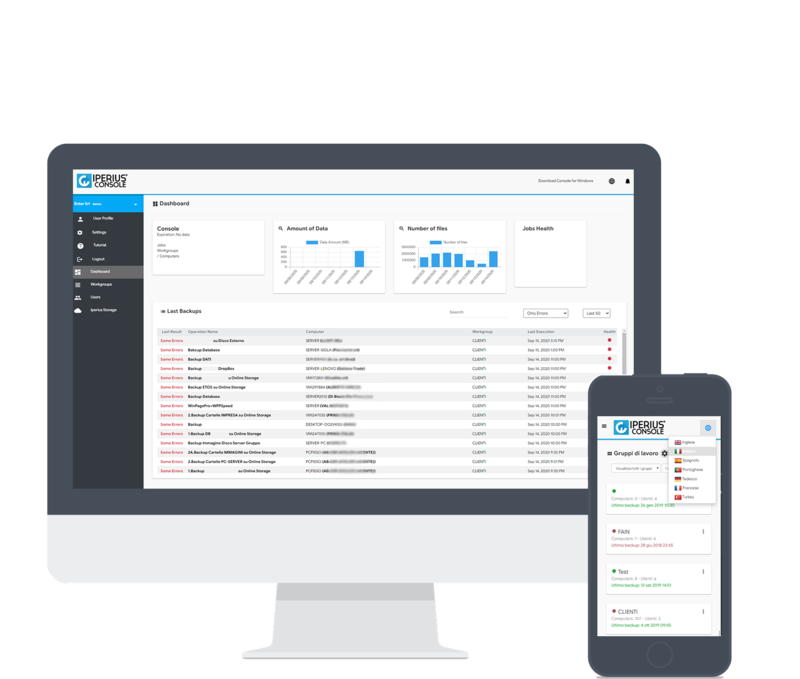 The simple, affordable and effective solution for centralized security management, for resellers and MSPs. Thanks to Iperius Console it is possible to monitor the Iperius Backup installations and the health status of data protection. Iperius Console is integrated with the other products of the Iperius suite. Saves time and resources, simplifying the work of monitoring IT infrastructure and customer backups. Iperius Backup includes a powerful web monitoring feature for all installations and all backups. The Iperius Console allows you to view the results of backups, see the details of any errors, update the program remotely, and run backups remotely. In addition you have many information to know the status of each PC or server where Iperius is installed. In a single and centralized dashboard you can view all servers and workstations where Iperius is installed, control backup jobs and their results. You can see the backup date and time, Iperius version, amount of data, number of copied files and possible errors. From the Iperius Console you can run one or more backup jobs remotely, without needing to connect to the computer where Iperius is installed. This can be very useful to run again a backup that returned errors. Moreover, you can automatically update Iperius to the latest version on all computers. Create custom users and administrators with different viewing and action permissions. You can create a user who only has access to certain workgroups and can only view them, but cannot run backups or delete items. With Iperius Console you can remotely enable, disable, or modify the schedule for all backup operations. An extremely fast and efficient way to have control over all installations, along with the ability to run backups remotely and update Iperius Backup. Thanks to a useful dashboard, you can have a very clear overview of the security status of monitored computers. You can easily view the number of computers and their status, and see if there are any errors or problems in backup operations. To help you access information, Iperius Console allows you to filter computers or backup operations based on their name, favorite computers, or errors. This allows you to immediately detect any problems.